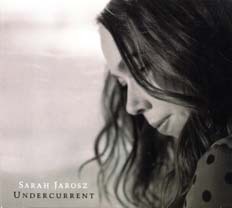 George Graham reviews Sara Jarosz' "Undercurrent"
In recent years we have had some excellent musical prodigies emerge especially in bluegrass and jazz, artists who show musical abilities well beyond what would be expected for their age. But prodigies grow up and it’s interesting to consider the musical directions they take after their initial emergence when they have some years under their belts. Examples in the folk and bluegrass world include Ricky Scaggs, Bela Fleck, Alison Krauss and Chris Thile. All have branched out to other styles beyond their initial bluegrass. This week, we have the new fourth album by multi-instrumentalist, singer and songwriter Sarah Jarosz, who released her first album in 2009 while she was still in high school. The new album is called Undercurrent. Sarah Jarosz grew up near Austin, Texas and started to learn the mandolin at age 10. She progressively got more into bluegrass, and took up a number of other string instruments. She was supported by her parents who took her to numerous events. At one of them, the Telluride bluegrass festival in 2007, she came to the attention of Nashville producer Gary Paczosa, who was enthusiastic enough that he signed her to Sugar Hill Records, which led to her debut album Song Up in My Head released when she was 18, and which we reviewed for this series. The new album is distinctive for her in a number of ways. During each of her previous albums, she was in school, first high school and then the New England Conservatory of Music, where she graduated with honors in 2013 with a degree in contemporary improvisation. So it is her first album since she graduated and her first since she moved to New York. It’s also her first with exclusively original material. Between her own performances and recordings, she has collaborated with two other women who have emerged from the contemporary acoustic scene, Sara Watkins, a founding member of Nickel Creek, and Aoife O’Donovan of Crooked Still, forming a group called “I’m With Her,” who have toured extensively and performed on the Prairie Home Companion show. Ms. Jarosz’ new album Undercurrent has a more intimate sound than some of her previous recordings. There are a few tracks which are just solo performances, and most of the rest is a trio setting with Mark Schatz on acoustic bass, and another guitarist either Jedd Hughes or Luke Reynolds, depending on the track. Lyrically, the compositions alternate between songs celebrating a love, and those about a breakup. Ms. Jarosz’ vocals are better than ever, enhancing the subtle, intimate sound of the album. Sarah Jarosz’ new fourth album Undercurrent could also be titled “understated,” in the best sense. She has matured as a songwriter, with all the tracks being compositions she wrote or co-wrote. While lyrically she covers the same ground as many songwriters in the past, she does it with a great level of taste and sincerity. Her vocals are appealing as always, and the tasteful, sparse production is a perfect match, with some tracks being purely a solo performance by Ms. Jarosz, and being enough to convey the song most effectively. She plays a number of instruments on the album, including the octave mandolin fairly frequently, which gives a distinctive sound and adds an interesting texture to the other more conventional acoustic instruments. While those instruments suggest bluegrass, the album is a lot more, stylistically, building on the eclecticism of some of her contemporaries like Nickel Creek and Crooked Still. Our grade for sound quality is a rather rare full “A.” The acoustic instrumentation is warm-sounding and intimate at times, while at others surprisingly atmospheric, which turns out to work quite well. The dynamic range, how well the recording maintains the differences between loud ans soft, is much better than average for these days. Sarah Jarosz has gone from a high-school aged musical prodigy to a 25-year-old mature young artist and I’m sure that there is a lot more we’ll be hearing from her. In the meantime, her new CD Undercurrent is a gem.